I have given three of these clocks as gifts and they are a hit EVERY TIME. I originally ordered a small one for myself, but have given the larger ones as gifts. They keep perfect time; are decorative colors; and are always received with a smile. Very happy with this product. I love this clock. I happen to love most clocks and have many different clocks in our home. But, Cuckoo Clocks always had a certain draw for me; ever since I was a little girl and would stare at a neighbor's clock for hours. I do have a Black Forest Clock that I cherish. 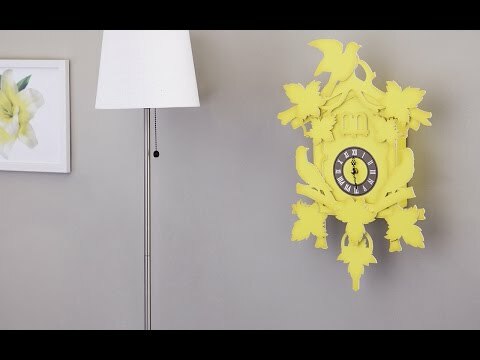 But, a few years ago, my friend gave me the Large FunDeco clock in yellow. It was such a surprise and I love it. It looks great on the wall and is the perfect addition to my collection. I ordered the large size in white for my craft studio, knowing that it was not something I would ever make myself. What a delight this clock is!! I have painted the walls and parts of the furniture that stores all my craft supplies in shades of green and purple... much of the storage furniture is white. I have placed this lovely clock on a purple wall, and have not yet decided whether to add color to it. It pops in the room as is. Perhaps a chartreuse or lavender painted edging is in this clock's future. It is the exact quirk I wanted in my space. Thanks! This is a lovely, charming clock. It would be fabulous for a nursery or pre-school, etc. 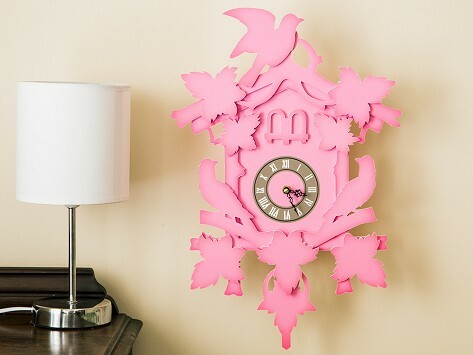 I am so sorry but this clock is the cheapest looking item that I have ever ordered from you. It is made of cardboard and actually bends very easily. This was supposed to be a gift but I could not give it because this was a joke. If you look back you will see that I have spent thousands o dollars from the Grommet, I can not send it back because I do not have the reciet or the box. This is a huge dissapointment.